A problem frequently faced by economy car buyers is that the subcompact class is not exactly known for feature-rich and attractive automobiles. It's hard to drive an economy car without feeling like an economy car owner. It often seems with great fuel economy comes certain sacrifice. Considerations such as creature comfort, safety, and your dignity can get left behind. That's how it used to be, but 2015 Hyundai Accent reviews agree that with the new Accent, the only thing you'll have to give up is frequent trips to the gas station. Available as a 4 door sedan or as a 5 door hatch or sport hatch, the Accent is a well-appointed and spacious automobile that also happens to be particularly parsimonious with the petro. With steering-wheel mounted controls, you can change the station on your six-speaker audio system, turn up the volume, or engage cruise control without ever taking your hands off the wheel. Power windows and locks, one-touch triple turn signals, six-way adjustable driver seat, exterior temperature display, air conditioning, hands-free Bluetooth, USB ports and more all come as standard features. 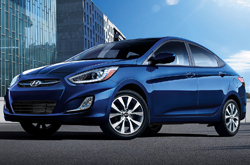 If you are up for some fun, test-drive a 2015 Hyundai Accent in Arlington. 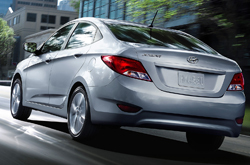 The Accent is powered by an eco-efficient 137 horsepower 1.6-liter GDI engine that generates and 123 lb.-ft. of torque. This feisty 4-cylinder can be coupled with a 6-speed manual or 6-speed automatic transmission. Translation: this car is actually fun to drive. No worries about merging with freeway traffic or having enough power to pass when you need it. In addition to six airbags, Hyundai provides the Accent with its comprehensive Vehicle Stability Management (VSM) system on the Accent, which links and optimizes the function of active safety in potential collision situations to help avoid accidents. With class-leading fuel economy, great features, fun driving dynamics and its bold fluid contours, there is no reason to settle for less. 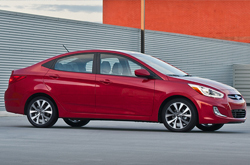 You can see the 2015 Hyundai Accent in Arlington at Vandergriff Hyundai, or learn more as our 2015 Hyundai Accent review continues below. If you've ever thought about purchasing vehicles like the 2015 Ford Fiesta, Nissan Versa, Mazda2, Chevrolet Sonic and the Toyota Yaris in Dallas-Ft. Worth, compare Hyundai's new 2015 Accent first; we're positive that it's the best match for you. The Accent's sharp design, user-friendly cabin amenities and cut-rate sticker price are sure to win over TX shoppers. 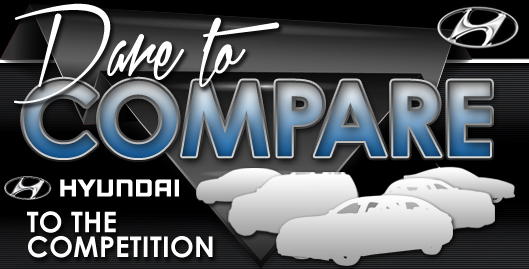 Compare its price to the competition and you'll see that it's a fabulous value, which is one of the main reasons why so many Dallas-Ft. Worth drivers select it. Find even more information about what it offers; see our quick-facts list for the Accent - bullets under this text. Thank you for reading Vandergriff Hyundai's 2015 Accent review! We're a well&$45;respected car dealer in Dallas-Ft. Worth for a reason, part of which is that we provide reviews created by expert writers who are at the height of their craft. Every passage comes stuffed with helpful information, specs and research - just what you need to make sensible decisions about your next Hyundai purchase. Please visit our Hyundai review and compare gallery if you feel the Accent is not fit for you; there you&ll learn about Vandergriff Hyundai's entire lineup.